Blogs are a funny thing. You write whatever occurs to you, and other people read it if it takes their fancy. It seems impermanent and fleeting – but it’s really not. I’m conscious that what I write will be online forever thanks to caches and the like. I won’t be able to take my content down down or alter my online history. When the children are older, they’ll be able to see exactly what I’ve written. Work colleagues, loose acquaintances and family stumble across the blog thanks to the vagaries of social networks. With all this in mind, I’m unlikely to write about the fact my bathroom often needs a scrub, my crisper could do with a spring clean or our latest discipline challenge with the children. I read something very succinct a while back on one of my favourite knitting blogs, knit the hell out, about how blogs are people’s exterior representation of themselves and that there’s not much to be gained by comparing one’s own interior to that representation (I can’t find the post now – Cassy feel free to link up in the comments if you’re reading!). It really struck a chord with me – mainly because it’s easy to become insecure about others’ beautiful blogged lives and fantastic projects with seemingly endless designer materials, but also because I get lots of comments about how I manage everything. My life is chaotic, the house is generally a mess, I’ve recently returned to the workplace part-time and we have two strong-willed children under three. Do I need to say any more? All of this is a long-winded and round-about way of saying that things aren’t always perfect at our place – but you won’t read about it here. 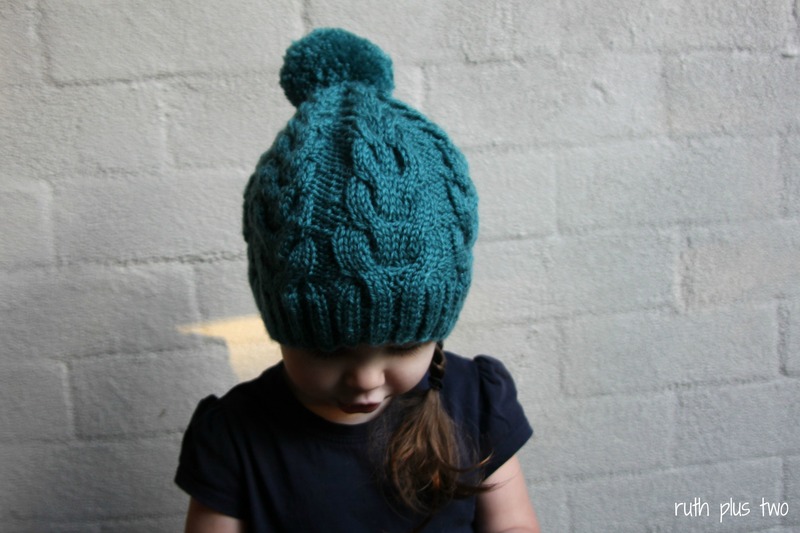 Except for today…and this blasted beanie I’ve been knitting. I’m more than happy to share my craft fails. I wrote about this hat a while ago. I bought the yarn to make a birthday present for a lovely little boy but jut couldn’t get it to work. Needless to say he got a different gift. Pulled apart and knitted up a number of times, I eventually decided the pattern might not be the best use of the yarn, ripped my latest disaster apart and cast on an I heart cables for a little girl who was also expecting a birthday. It was still atrocious. This is the sixth iteration of a hat with this yarn and I’m still unhappy. Really unhappy. Somehow it looks decent enough on, but it has big holes behind the cables despite me trying every trick in the book to tighten them up. I’d be knitting along for a while and then all of a sudden have an *extremely* loose stitch. I’d even out the yarn so the super loose stitch no longer existed, but then have another one on the next or subsequent row. It could just have been me, or it could have been the yarn. I’ll probably never work it out. It’s not driving me nuts at all. I considered pulling the whole thing apart and starting on something else, but I suspect that wouldn’t be a happy experience either. I pressed on and got it done. Elena is pleased to have received a new beanie, and hasn’t noticed one of the cables has gone askew. She adores the pom pom (made using this tutorial). I’m just pleased to have cast it off! I only blocked it gently – I suspect it might respond well to a hard blocking but it is on the big side already and I didn’t want to risk it stretching too much. I must say, however, that I didn’t mind this pattern. I think it has a few errors in it (I’m not at all experienced with cables, but I don’t think the designer’s instructions match the abbreviations and would lead to it all being uneven), but other than that it has been workable and looks quite sweet. 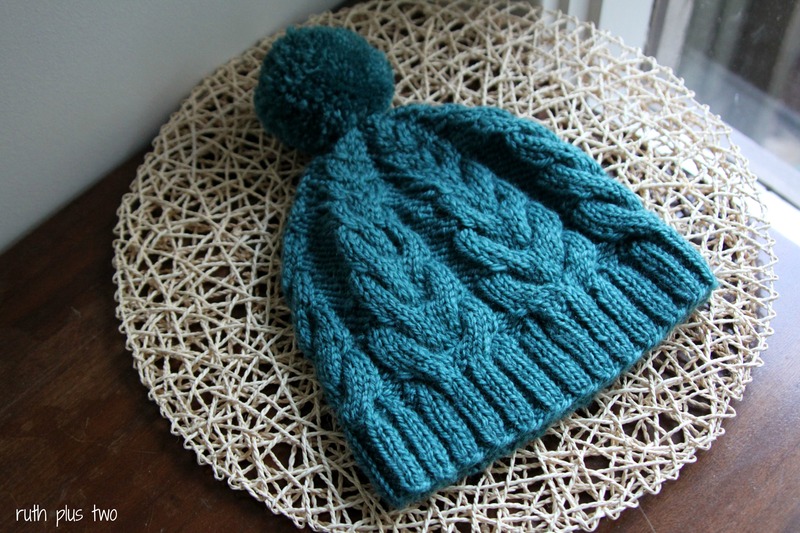 When I’ve recovered from the trauma of this hat I may well knit another I heart cables – but you can be sure as heck I won’t be using Clekheaton Country Aran. I think it’s time for a sewing project or three. This entry was posted in blogging, clothes for children, knitting, yarn. Bookmark the permalink. Happily or sadly depending on how you look at this, I can’t see any flaws in the beanie. I like the colour. I agree – it looks absolutely amazing. I wish I could do such gorgeous disasters. what do you mean by holes? Remember there is a gap/hole sort of thing just on the basis of the weaving aspect of the cable. The holes are big enough for me to stick my whole index finger through, though. Surely that’s not right? from memory yes, I haven’t knitted cables for a long time but yes. They shouldn’t really be visible though, which I don’t think they are from the pictures. Maybe it’s not as bad as I fear, then? I don’t think you’d see the holes unless the beanie was really stretched. Thanks, Jenya. Maybe your little monkey would like one. Do you knit? The beanie looks absolutely adorable on Elena! Large 3D cables on a kid make it look supercute. But I understand the issue of holes: I’ve made a cabled beanie for myself and it has… ventilation 🙂 I guess, that’s the price for the looks. Ventilation! Why didn’t I think of that?? That’s kind. To be honest, I think it photographed pretty well. There’s an upside, I suppose – I won’t be remotely precious about her wearing out with the chickens and potentially ruining it. Adorable! I see why she likes it. I love the beanie! Its adorable. That’s always an option, I guess. If the level of detail I’ve shared ever makes me feel uncomfortable about such a public audience, I can always change it over. Precisely! Although, one thing you did say struck a nerve with me. You can’t erase whats on the internet. Not 100% for certain anyway. It’s a good thought and I’ve made a few changes. Thank you for reminding me! There are blogs that have content to attract readers/followers and there are also blogs that are merely just diaries, like mine. I like to write about things or days that have brought me lots of joy and happiness, days that means a lot to me, so that one day when I read my blog again, I can reminisce about those happy days and memories. As for the beanie, I think it is absolutely beautiful!!! You did an amazing job!! 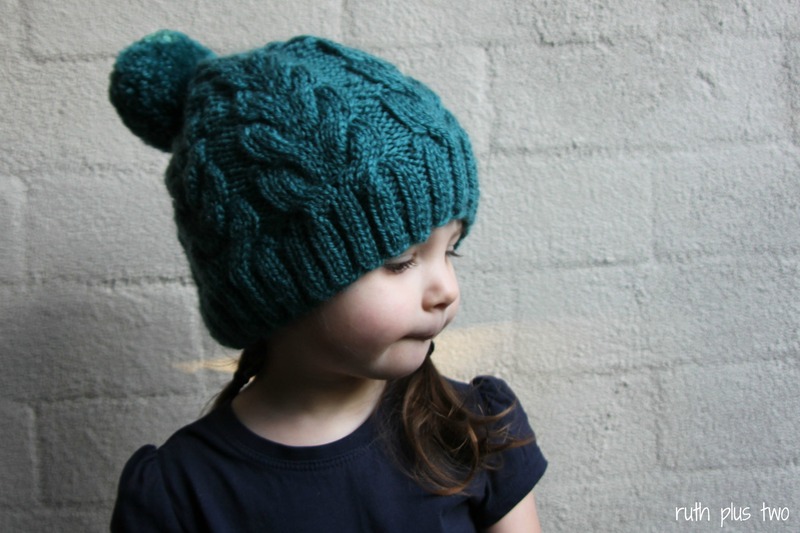 Now you make me want to knit one for my little girl!! That’s a nice way to use a blog 🙂 This one started as a way of keeping in crafty contact with a friend overseas and just picked up other people as it went along. I really like what it has become – a rambling record of what we’ve been up to in the garden, what I’ve been sewing, knitting and cooking – with new friends from all over the place. It’s gorgeous – worth leaving the house and the bathroom to the grimy goblins! It wouldn’t take much for me to make that decision. To be honest, I think I just need to bite the bullet and get a cleaner. That’s it! Thanks 🙂 I really like the idea of having a ‘purl side’. It’s like you have a hierarchy of procrastination instead of needs…Perhaps I should add something into my life I dislike more than housework. That might solve my problem!